Around 6 April 699 years ago, an important document left Arbroath Abbey on a long journey to Pope John XXII in Avignon. 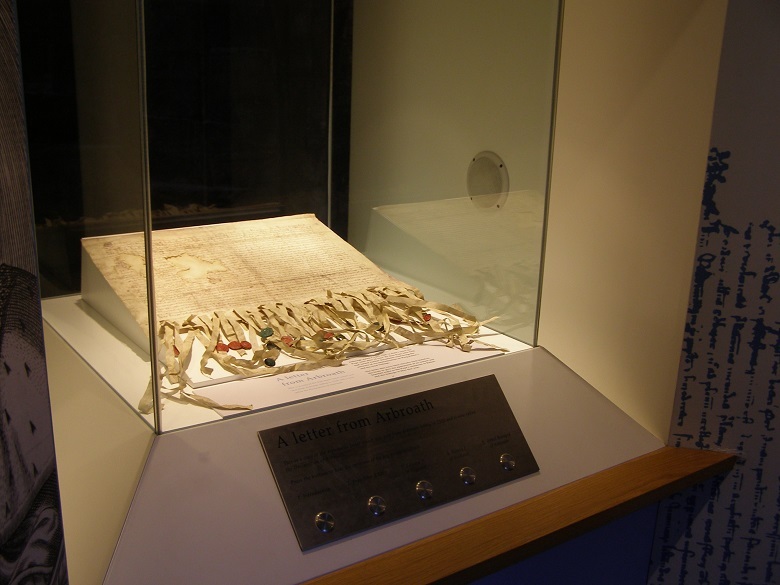 That document is now known as the Declaration of Arbroath. 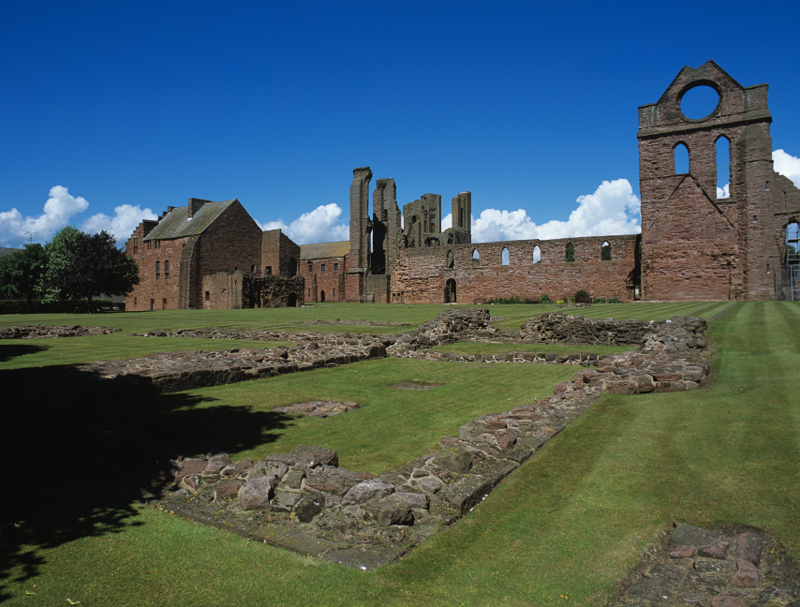 The Declaration was dated 6 April 1320: it may not have left Arbroath the same day, but the date is significant. In that year, 6 April was the Sunday after Easter, which marks a festival known as Quasimodo. Nothing to do with the Hunchback of Notre Dame: this was a time of renewal and redemption. The Declaration was seeking redemption in Scotland’s relationship with England and with the wider world. What did the Declaration say? 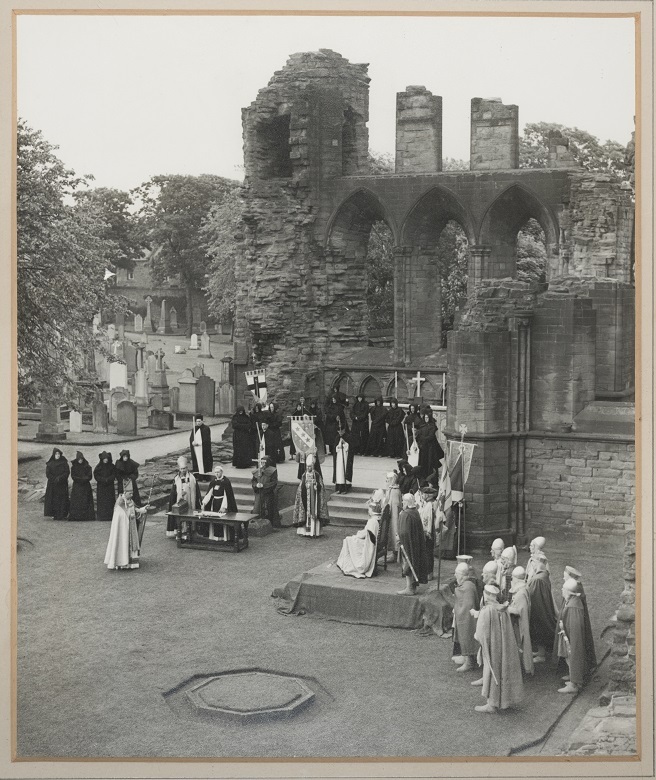 A re-enactment of the Declaration of Arbroath performed by the Arbroath Pageant Society. Date unknown. It was a letter to the Pope from the ‘Barons’ of Scotland – a swathe of noblemen and landowners pledging loyalty to King Robert the Bruce. The letter also noted that it represented ‘the whole community of the realm’. It was accompanied by letters from the king himself and from his ally William Lamberton, Bishop of St Andrews, though these have now been lost. So this message to the Pope was endorsed by the king and the ‘Three Estates’ of his realm: church, nobles and ordinary people. The Declaration was worded skilfully, forcefully and with some elaboration. But its message was straightforward: we must be recognised as an independent country with its own legitimate king. 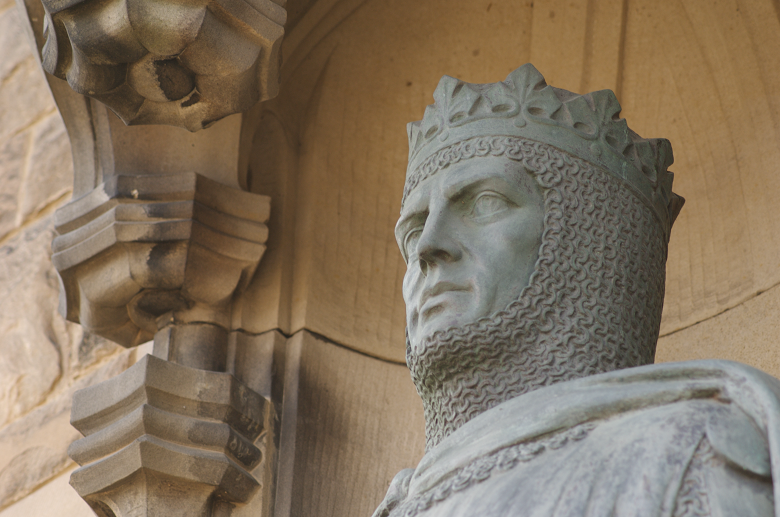 Bruce had become King of Scots in 1306. In 1314 he had triumphed over a vast English army at Bannockburn, driving out the occupying power. 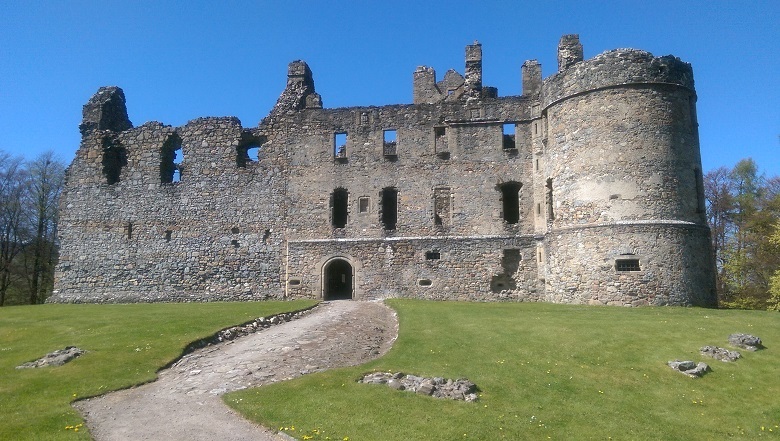 But English attempts to gain control of Scotland continued. Bruce’s claim to the throne was still disputed by the English, and by the papacy. This enraged him so much that he had refused to acknowledge letters from Pope John, which failed to address him as rightful King of Scots. As a result, he had been excommunicated. He was officially excluded from the Church, and therefore from Christian Salvation. This was no laughing matter in an age when everyone had a vivid idea of eternal damnation in Hell. Equally crucial to Bruce’s kingship was the loyalty of his own subjects, and this too was in doubt. He had seized the throne after murdering John Comyn, a key supporter of the royal Balliol dynasty. Almost his first act as king was the ‘herschip of Buchan.’ This ruthless military offensive aimed to wipe out the Comyns in their north-eastern homelands. Few people can have seen this is as the action of a just and peace-loving king. But Bruce had gradually built up popular support, through a long campaign of guerrilla warfare against the English, coupled with a political programme of bestowing lands and titles on his allies. Despite this, some Scots still believed their rightful monarch was Edward Balliol. Edward was son of King John, who had been forced to abdicate in 1296 and died in exile in 1314. 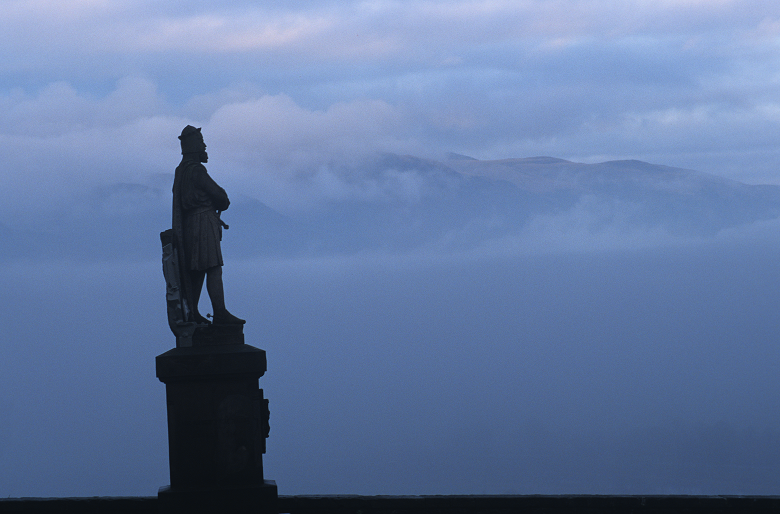 Edward Balliol was poised to claim the Scottish throne, with English support. The Declaration alludes to this, declaring that the Scots would depose any king ‘seeking to make us or our kingdom subject to the King of England or the English’. This is not only a dig at English-backed Balliol. It also helps justify Bruce’s seizure of the crown, to prevent it falling under English control. And crucially, it invites the reader to hold Bruce to his word. If he ever did yield to the English, he would be inviting his people to depose him. The Declaration of Arbroath (as it later became known) was an important milestone in Scotland’s long struggle for independence and recognition. It greatly improved relations with Pope John. Bruce’s excommunication was put on hold and referred to him as ‘Robert illustrious King of Scotland’. But the English were not so easily convinced. It was eight years before the Treaty of Edinburgh brought a temporary halt to the Wars of Independence. It was not until 1357 – nearly 30 years after Bruce’s death – that peace was finally achieved with the Treaty of Berwick. Until then, the conflict continued.